Baden Big Leaguer™ Plastic Training Balls are the only "whiffle" type ball or poly ball with embossed red seams to simulate the look of real baseballs. These balls help simulate game conditions, improve baseball eye training, and make practice more realistic. 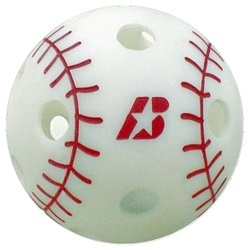 Perfect for soft toss practice, backyard training, or for use with training bats like the Insider Bat.